Definition: Diseconomies of scale lead the marginal cost of a product to increase as a company grows. This typically follows the law of diminishing returns, where the further increase in the size of output will result in an even greater increase in average cost. This concept is the opposite of economies of scale. In Business, Diseconomies of scale are the factors that lead to an increase in average costs as a business grows beyond a certain size. Diseconomies of scale can occur for a variety of reasons, but the cause usually comes from the difficulty of managing an increasingly large workforce. As a firm grows, it seeks to reduce the marginal cost of its products, increasing efficiency as it increases production. Improved efficiency results in greater profit per unit of production. However, when there are diseconomies of scale, after a certain point, which varies by industry and by business, the marginal cost for the product begins to rise. Factors contributing to inefficiency may include cumbersome bureaucracy, high costs of geographical expansion, high legacy costs (such as pension liabilities from an aging workforce), and overlapping product lines that compete for the same market and production resources. 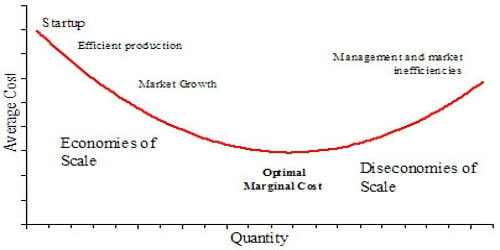 The standard curve showing the relationship between product cost and quantity and the downward curve toward economies of scale and the upward curve into diseconomies of scale demonstrates this process. Diseconomies of scale specifically come about due to three reasons. The first is a situation of overcrowding, where employees and machines get in each other’s way, lowering operational efficiencies. The second situation arises when there is a higher level of operational waste, due to a lack of proper coordination. The third and final reason for diseconomies of scale happens when there is a mismatch between the optimum levels of outputs between different operations. Essentially, diseconomies of scale are the result of the growing pains of a company after it’s already realized the cost-reducing benefits of economies of scale. Relationship with economies of scale: If a firm faces constant input costs, then decreasing returns to scale imply rising long-run average costs and diseconomies of scale. However, it is possible that if the firm gains purchasing economies then increasing the factor inputs by 50% may not actually increase costs by 50%. Therefore, it is possible to have decreasing returns to scale, but not necessarily diseconomies of scale. But, if we assume a constant input price, decreasing returns will cause diseconomies of scale. Problems with Diseconomies of Scale: Diseconomies of scale can happen for many reasons, but overall, they arise because of the difficulties of managing a larger workforce. Several problems can be identified with diseconomies of scale. First, communication becomes less effective. As a business expands, communication between different departments becomes more difficult. Employees may not have explicit instructions or expectations from management. In some instances, written communication becomes more prevalent over face-to-face meetings, which can lead to less feedback. Another drawback to diseconomies of scale is motivation. Larger businesses can isolate employees and make them feel less appreciated, which can result in a drop in productivity. Solutions: Solutions to the diseconomies of scale for large firms may involve splitting the company into smaller organizations. This can either happen by default when the company is in financial difficulties, sells off its profitable divisions and shuts down the rest; or can happen proactively if the management is willing. 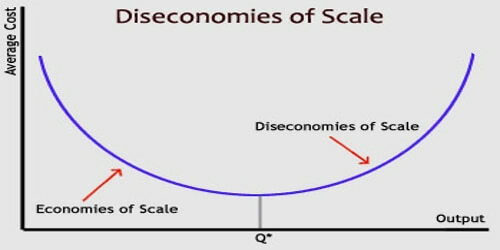 To avoid the negative effects of diseconomies of scale, a firm must stick to the lowest average output cost and try to recognize any external diseconomies of scale. A systematic analysis and redesign of business processes, in order to reduce complexity, can counter diseconomies of scale. This leads to increased productivity. Improved management systems and more effective control of labor and operations can lower overhead. When a company/product reaches the point where its marginal cost increases, it becomes a target for smaller, more efficient firms to compete for its business. A company at this point may evaluate restructuring its operations, spinning off various production units, or closing some of its operations. Companies also use a variety of strategies to minimize diseconomies of scale, such as flattening management structure, investing in technology to improve communication, careful market segmentation, and decentralizing production.